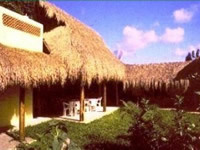 Cozumel Bed and Breakfast in Cozumel - Bed and Breakfast Amigo's Bed and Breakfast in Cozumel, Mexico: Cottage style rooms with kitchenette set in large tropical garden with swimming pool. All rooms have complete kitchenette (refrig,2 burner hotplate,microwave,cooking/eating utensils),private bathroom, AC,ceiling fans, CD/cassette players, nightlights and clock radio alarm clocks. Public area has wireless high speed internet ( bring your laptop! ),TV,VCR, DVD, books, games, magazines, exercise bike and more. 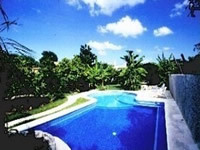 Large tropical garden has many fruit trees and large free form multilevel swimming pool. Family friendly. Located 5 city blocks from ocean in the quiet residential area of the original quadrant of town.. short walk to the main plaza. 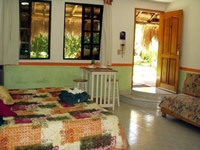 Prices are based on single or double occupancy and are per room including all taxes and daily breakfast. For extra person add 10 US per night up to 2 extra in the room. Gratuity to staff not included in prices. Deposit required to secure reservation. Charming town with selection of restaurants, shops, friendly folks. Quiet neighborhood and nearby will find money exchange, internet cafe, 24 hour corner store, ATM machine, pharmacy and large grocer plus restaurants and shops..
Cozumel is host to the second largest barrier reef system in the world, the great Mayan reef.Scuba diving, snorkeling, all sorts of water sports, sports fishing, deep sea fishing fly fishing, para sailing, kite surfing and more extreme sports also available. Mayan ruins are nearby. Wonderful Island museo and interesting parks to visit.